When I was ten, I had a vision: a micro-obsession of sorts. When Diem Chau was ten, she was carving everything in sight. But I'll get back to her in a moment. This was my vision: a Crayola crayon being pushed down into the surface of a scalding hot, shiny silver toaster oven. What might happen? Delight of delights!... I could not wait to accomplish my wondrous plan! And because I happened to be holding a bright red crayon at the time... and the toaster oven happened to be turned on (I was cooking toast at the time), my vision was realized within mere seconds! Soon I gazed, dumbfounded, at the glorious phenomenon, the brilliant spectacle: red wax, oozing out in every direction, the crayon rapidly decreasing in size. Then I panicked. I turned the toaster off, grabbed a towel, and tried to wipe up the gross mess (which only made things worse; the toaster oven was already ruined). It's a big long story on how I got into the crayons... to make it short... money has always been tight. I found it REALLY HARD to be creative with expensive materials. All I could think about was how much it was costing me or how I would pay for it. So I went back to what I knew before art school (heck before school p.e.r.i.o.d.)... simplicity & play... 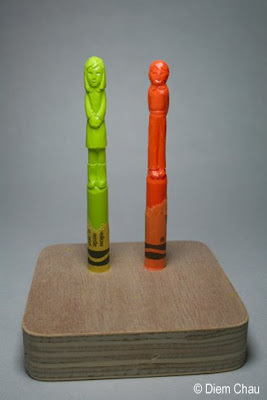 I carved on a lot of things... the crayons stuck :) It ended up being that way because they are such powerful objects. Everyone has one and remembers them... they're beautiful, colorful... when carved they produce a very nice luster... they're happy. The do remind me a lot of childhood, for better or for worse. They're cheerful, but also incredibly fragile and once broken can never be mended. 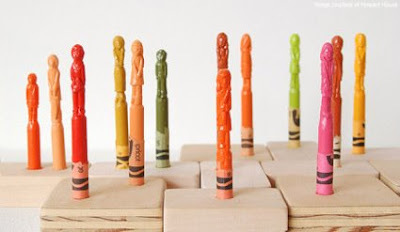 Sometimes I think the accidental breaking of a crayon sculpture becomes an integral part its meaning.